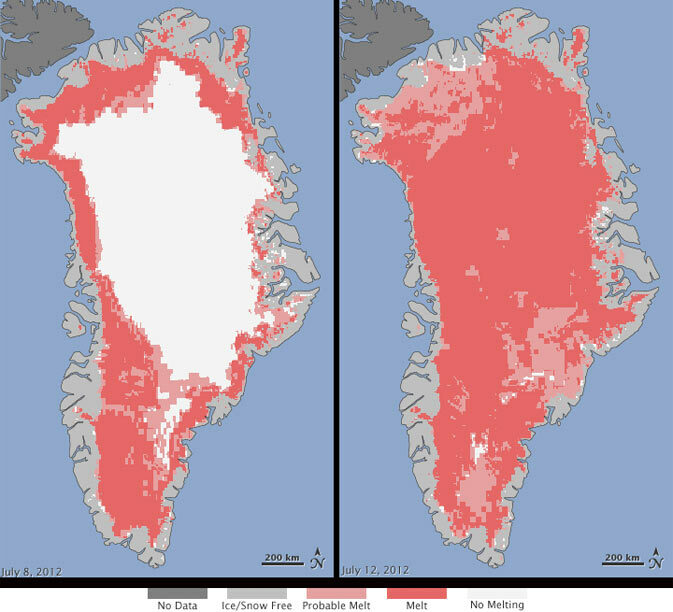 PASADENA, Calif. – For several days this month, Greenland’s surface ice cover melted over a larger area than at any time in more than 30 years of satellite observations. Nearly the entire ice cover of Greenland, from its thin, low-lying coastal edges to its 2-mile-thick (3.2-kilometer) center, experienced some degree of melting at its surface, according to measurements from three independent satellites analyzed by NASA and university scientists. 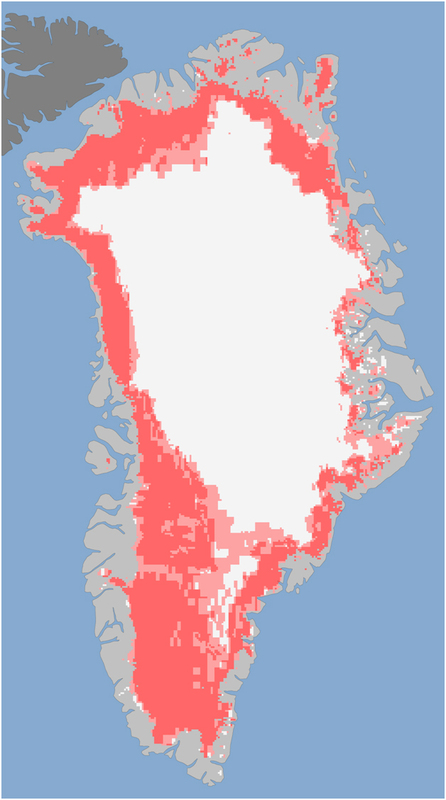 On average in the summer, about half of the surface of Greenland’s ice sheet naturally melts. At high elevations, most of that melt water quickly refreezes in place. Near the coast, some of the melt water is retained by the ice sheet, and the rest is lost to the ocean. But this year the extent of ice melting at or near the surface jumped dramatically. According to satellite data, an estimated 97 percent of the ice sheet surface thawed at some point in mid-July. Thomas Mote, a climatologist at the University of Georgia, Athens; and Marco Tedesco of City University of New York also confirmed the melt seen by Oceansat-2 and MODIS with passive-microwave satellite data from the Special Sensor Microwave Imager/Sounder on a U.S. Air Force meteorological satellite. This extreme melt event coincided with an unusually strong ridge of warm air, or a heat dome, over Greenland. The ridge was one of a series that has dominated Greenland’s weather since the end of May. “Each successive ridge has been stronger than the previous one,” said Mote. This latest heat dome started to move over Greenland on July 8, and then parked itself over the ice sheet about three days later. By July 16, it had begun to dissipate. Even the area around Summit Station in central Greenland, which at 2 miles (3.2 kilometers) above sea level is near the highest point of the ice sheet, showed signs of melting. Such pronounced melting at Summit and across the ice sheet has not occurred since 1889, according to ice cores analyzed by Kaitlin Keegan at Dartmouth College in Hanover, N.H. A National Oceanic and Atmospheric Administration weather station at Summit confirmed air temperatures hovered above or within a degree of freezing for several hours July 11 to 12. Nghiem’s finding while analyzing Oceansat-2 data was the kind of benefit that NASA and ISRO had hoped to stimulate when they signed an agreement in March 2012 to cooperate on Oceansat-2 by sharing data. Wow, that’s really scary. Maybe I should become like Al Gore and buy a giant, carbon spewing jet plane for myself and live in mansions that use eighty times as much energy as my tea party neighbors’ homes. At least they slipped that part about the ice melting just like this every 150 years in at the bottom where most people aren’t even still reading anymore. I’ve sent off a note to the NASA writer, seen here. Maybe she’ll get the headline fixed. 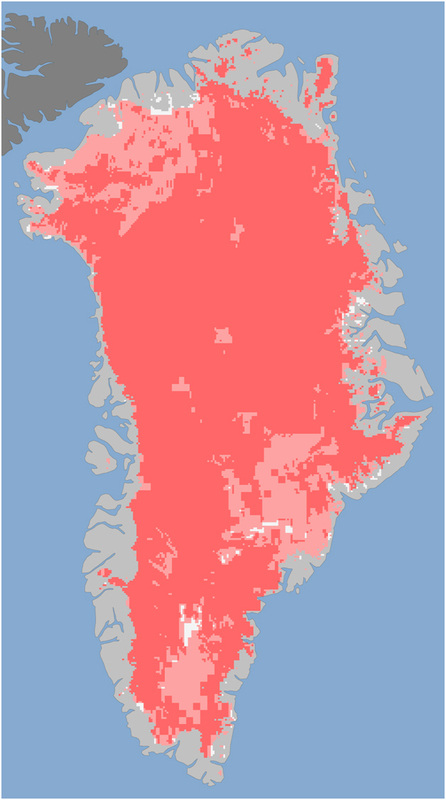 On average in the summer, about half of the surface of Greenland’s ice sheet naturally melts. At high elevations, most of that melt water quickly refreezes in place. Near the coast, some of the melt water is retained by the ice sheet and the rest is lost to the ocean. But this year the extent of ice melting at or near the surface jumped dramatically. According to satellite data, an estimated 97 percent of the ice sheet surface thawed at some point in mid-July. Ah, darn. That’s too bad. And I’d gone down to the San Fran Nan Lib store and bought myself a nice tinfoil hat and everything. NASA should have fired global warming alarmist pseudo-scientist frauds like James Hanson forty years ago. That was when James Hanson first came out as a fraud alarmist with his hysteria about an ice age (global cooling). Then he flipped on a dime – because that’s what science is, isn’t it? – and became one of the leaders of the “global WARMING” movement. But that turned out to be a clearly bogus claim as we kept racking up some of the coldest winters in modern history. The problem was that global temperatures kept PLUNGING when they had predicted they would be RISING. So they changed “global warming” to “climate change” because “global warming” had become such an obvious fraud. And now they’re saying it’s so damn cold because it’s so damn hot in the winter and then saying “Aha! LOOK at the global warming!” every summer. Contrary to the typical straw-man presentation provided by the media, the vast majority of so-called “global-warming skeptics” actually accept that there is indeed evidence of warming in our climate. In fact, they see a persistant global warming cycle that has dominated earth’s atmosphere for the past 10,000 years and which extends into the distant past through a million years of periods of ice ages and warm intergalacials. What they doubt is that man has had any significant impact upon the warming that we see today. These skeptics of anthropogenic – or man-caused – global warming would also argue that there are excellent reasons to doubt that the warming seen today is as significant as is routinely claimed by global warming alarmists in both the media and the scientific community. The following provides a survey of the first few chapters of the book, “Unstoppable Global Warming Every 1,500 Years” by Dr. S. Fred Singer and Dennis T. Avery. NASA was recently forced to acknowledge that it had [accidentally?] inflated its official record of surface temperatures in the US beginning with the year 2000. The revised data now shows 1934 as the warmest year, followed by 1998, 1921, 2006, 1931, 1999, and 1953. This is significant because 4 of the top 10 years on record occur before World war II, before human emissions could have been responsible, whereas only 3 of the top 10 years are from the past decade. Furthermore, new data are also emerging rasing substantial doubts about the veracity of the surface temperature records kept both in the US and globally. Meteorologist Anthony Watts launched an effort to photograph 1,221 surface temperature recording stations in the US to see if land use changes might be contaminating the record. Images of the stations he’s photographed so far (www.surfacestations.org) show many cases where stations seem to be reporting warming caused by parking lots, nearby buildings, and heat-generating activities such as air conditioners which have been built around the stations since they originally began taking measurments decades ago. For example, the temperature station in Orland, California, has been in the same location for more than 100 years and shows no evidence of being affected by nearby development. It shows a declining temperature trend from 1880 to 2007. But the temperature station in nearby Marysville, California has been surrounded by development in the form of an asphalt driveway, the base of a large cell tower, and air condiditoning units in nearby buildings. That station shows a warming trend. Many of these stations were located at airfields which originally were little more than dirt strips with a couple of small buildings. As Watts’ team finds more and more stations such as the one in Marysville, it is becoming clear the US temperature records shows more warming than has actually occurred. One is therefore left wondering how much of the measured warming trend is real and how much is the result of contaminated data. Furthermore, the IPCC, in dismissing this claim, cited one paper as its primary justification for concluding that UHIs (Urban Heat Islands) did not affect the global temperature record. But the paper that they cited is now recognized to have been a fraud, with formal charges filed against its author, Wei-Chyung Wang. A British mathematician named Doug Keenan stumbled across Wang’s paper and noticed obvious red flags. Wang utilized Chinese data from the 1950s, and Keenan asked himself how a country in such disarray that it couldn’t even estimate its population within 100,000,000 people, could have so diligantly and accurately monitored so many temperature stations. A Freedom of Information Act request yielded information proving that the paper was a complete fraud. The question is, why would the IPCC have made this paper their centerpiece? Are they that incompetent, or are they rather so biased that they are not after truth, but only footnotes to substantiate their ideology? Anyone who refuses to take such evidence into account is not practicing science, but rather propagandizing ideology. Eric the Red’s settlement of Greenland near the end of the 10th century dramatically demonstrate the Earth’s long, moderate climate cycle. Sailing west from Iceland in 985 AD, the Vikings were pleased to discover a huge uninhabited island surrounded by ice-free waters and shores were covered with abundant green grass. They could grow vegetables and grace their animals. The colony thrived, and grew to 3,000 people by 1100, with 12 churches and its own bishop. What the Vikings could not have known was that they were benefitting from the Medieval Warming, a major climate shift that lasted approximately 400 years which made Northern Europe abot 2 degrees centigrade warmer than previously. Nor could they have realized that after this warming period ended, their grassy domain was doomed to a 500-year period of icy temperatures called the Little Ice Age. As the Little Ice Age progressed and pack ice moved closer to Greenland, the colonists were increasingly hard-pressed to survive. Less and less hay could be harvested in the shorter and cooler summers. The storms got worse. The abundant codfish followed warm waters south, away from the colonies. By 1410, glaciers had so crushed Greenland that the supply ships could no longer make the journey. Inuit hunters pushed south by the encroaching ice began to compete with the Norsemen. Skeletons found in the settlement’s graveyard showed the people were growing shorter and suffering poor nutrition; and a measurement of their tooth enamel indicates a nearly 1.5 degree C drop in average temperatures from 1100 and 1400. The last colonists were forced to eat the last of their milk cows, evidencing their desperation. Denmark would not be able to recolonize Greenland until 1721, when the Little Ice Age began to lose its grip on the huge island. Today, 150 years into the Modern Warming, Greenland is the home of 50,000 people and 20,000 sheep. But the ice cores and seabed sediments that tell us of 600 natural 1,500 year climate cycles over the past 1 million years contain the proof that the cycle will eventually shift yet again to descend Greenland into centuries of ice and hardship. Only superior modern technology such as improved ice-breaking ships will allow the modern Greenlanders to surive this next coming ice age. 2 million years ago: Cycles in Earth’s relation to the sun produce alternating Ice Ages (lasting 90,000 to 100,000 years) and “intergalacials” (lasting 10,000 to 20,000 years). The onset of the glacial period is often slow but ends abruptly at the transition to the warm period. The average global temperature changes 5-7 degrees C during this transition but may rise as much as 10-15 degrees C over a time span of less than 75 years at higher latitudes. 130,000 to 110,000 years ago: Eemian intergalacial, warm. 110,000 years ago: Fairly sudden shift to glacial conditions, over perhaps 400 years or less. Northern forests retreat south, ice sheets begin to take over much of the Northern hemisphere. Trees give way to grass, and then to deserts, as more water is frozen in ice sheets instead of falling as rain on vegetation. 60,000 to 55,000 years ago: In-between phase, partial melting of glaciers. 21,000 to 17,000 years ago: Last Ice Age reaches its coldest point. Deserts and semi-deserts take over much of the global land area. Sea levels are 400′ lower than today. 14,000 years ago: sudden warming, raising Earth temperatures to roughly present levels. Forests began to spread and the ice sheets to retreat. Sea levels begin to rise. 12,500 years ago: The Younger Dryas. After only 1,500 years of recovery from the Ice Age, the Earth suddenly shifts back into a new, short-lived ice age. The dramatic cooling seems to have occurred within 100 years or less. Another 1,000 years or so of ice age follow before another sudden shift back to climate warming. 11,500 years ago: The present intergalacial period known as the Holocene. The planet warms from ice age to nearly present world temperatures in less than 100 years. Half of the warming may have occurred in 15 years. Ice sheets melt, sea levels rise again, and forests expand. Trees replace grasslands and grass replace deserts. 9,000 to 5,000 years ago: Climate Optimum, warmer and wetter than the Earth’s present climate. The Saharan and Arabian deserts become wetter, supporting hunting, herding, and agriculture. The climate may have been “punctuated” by a cold, dry phase 8,200 years ago, with Africa drier than before. 2,600 years ago: Cooling event with relatively wet conditions in many parts of the world. 600 to 200 BC: Unnamed cold period preceding the Roman Warming. 200 BC to 600 AD: Roman Warming. Grape growing advances northward in both Italy and Britain. 600 to 900 AD: “Dark Ages” cold period. 900 to 1300 AD: Medieval Warming or Little Climate Optimum, recorded by histories in both Europe and Asia. 1300 to 1850 AD: Little Ice Age. 1850 to 1940: Warming, especially between 1920 and 1940. 1940 to 1975: Cooling trend. 1976 to 1978: Sudden warming spurt. 1979 to present: A moderate warming trend, very slight according to satellites and weather balloons, somewhat stronger according to surface thermometers. Note: the figures provided for the last 1,000 years are clearly confirmed by means of Tree Rings and Ice cores in addition to human records. In 1984, Willi Dansgaard of Denmark and Hans Oeschger of Switzerland published their analysis of the oxygen isotopes in the first ice cores extracted from Greenland, which provided a record of 250,000 years of Earth’s climate history. The scientists compared the ratio of heavier oxygen-18 isotopes with lighter oxygen-16 isotopes, which indicated the temperatures at the time snow had fallen in each layer. They expected to find evidence of the mega ice ages and briefer mild intergalacials, and they did. But they did not expect to find anything in between. To their suprise, they found a clear cycle – moderate, but abrupt – occurring about every 2.550 years running persistantly through history as they analyzed the core layer by layer [subsequent research would soon reassess this cycle at 1,500 years, plus or minus 500 years]. At the time of their work, no such long-term climate history had ever before been available. (see W. Dansgaard et al., “North Atlantic Climate Oscillations Revealed by Deep Greenland Ice Cores,” in Climate Processes and Climate Sensitivity, ed. J.E. Hansen and T. Takahashi (Washington, DC: American Geophysical Union, 1984), Geophysical Monograph #29, 288-98). With the famous work of Dansgaard and Oeschger, the importance of the discovery of climate cycles increased dramatically a year or so later when evidence of 1,500 year cycles was also found at the other end of the world – in an ice core from the Antarctic’s Vostok Glacier – by a French and Russian research team. Gerard Bond of Columbia University’s Lamont-Doherty Earth Observatory analyzed ice-rafted debris in sediments on the floor of the southern North Atlantic ocean. he found that – roughly every 1,500 years – there was a surge in the amount of rocky bits picked up by the glaciers as they ground their way across eastern Canada and Greenland and then floated out to sea. This more abundant ice-rafted debris was also floated much farther south before it dropped to the sea floor as the icebergs melted. Both the increase in the volume of debris and its floating much farther south indicate severe cold periods. Bond’s team analyzed two deep-seabed cores, from opposite sides of the North Atlantic, which took them back 30,000 years into prehistory, and into the Ice Age itself. They used high-resolution mass spectrometers to carbon-date the plankton fossils (and thus the layers) in the sediments. The proxies definitely indicated a series of ice intrusions big enough to deliver increased iceberg sediments to two southerly sites more than 1,000 km apart. “Evidence from North Atlantic deep-see cores reveals that abrupt shifts punctuated what is conventionally thought to have been a relatively stable Holocene [intergalacial] climate. During each of these episodes, cool, ice-bearing waters from north of Iceland were advected as far south as the latitude of Britain. At about the same times, the atmospheric circulation above Greenland changed abruptly. … Together, they make up a series of climatic shifts with a cyclicity close to 1,470 years (plus or minus 500 years). The Holocene events, therefore, appear to be the most recent manifestation of a pervasive millennial-scale climatic cycle operating independently of the glacial-intergalacial climate state.” (G. Bond, “A Pervasive Millennial Scale Cycle in North Atlantic Holocene and Glacial Climates,” Science 278 (1997): 1257-266). Bond’s climatic cycles in the North Atlantic matched those found in the the cores from the Greenland Ice Sheet, very much strengthening the confidence that the cycles are real and significant. A subsequent study by Bond, also published in Science, which demonstrated the linkage between the Earth’s warming-cooling cyle and the sun, using carbon-14 and beryllium-10 as proxies for solar activity warming/cooling. Bond then did a follow-up study, published in 2001, counting ratios of carbon and beryllium isotopes in the sediments and found these solar proxies correlated very closely with the climatic cycles found in the iceberg debris. He found 9 of these cycles in the last 12,000 years (an average of every 1,333 years). (G. Bond, “Persistant Solar Influence on North Atlantic Climate during the Holocene,” Science 294 (2001): 2130-136). Ulrich Neff of the Heidleberg Academy of Sciences found Bond’s Atlantic seabed cycles replicated in a cave stalagmite on the distant Arabian Peninsula, taking the documented reality far beyond Europe and the North Atlantic. (see U. Neff et al., “Strong Coherence between Solar Avialbility and the Monsoon in Oman between 9 and 6 kyr Ago,” Nature 411 (2001): 290-93). In 1996, Lloyd Keigwin reported finding the 1,500-year cycle in the sea surface temperatures of the Sargasso Sea, reconstructed from the oxygen isotopes in the tiny one-cell organisms of a seabed sediment core. (see L. Keigwin, “The Little Ice Age and Medieval Warm Period in the Sargasso Sea,” in Science 274 (1996): 1503-508). During the past decade, numerous researchers have found the 1,500-year cycle in many long-term temperature proxies, particularly from isotopes of oxygen, carbon, beryllium, and argon trapped in glacier ice, from fossil pollen records, and from algae cyst assemblages in lake and seabed sediments. (see A.E. Viau et al., “Widespread Evidence of 1,500-yr Climate Variability in North America During the Past 14,000 Years,” Geology 30 (2002):455-58). Peter deMonocal led a team studying plankton fossils and airborne dust in a deep-sea core from the Atlantic coast of Africa at Cap Blanc, Mauritania. DeMonocal’s results confirmed the same set of cycles identified by Bond’s iceberg debris in the North Atlantic, this time thousands of kilometers closer to the equator where ice never forms. Changes in plankton numbers and species gave the deMonocal team ocean temperature readings from the past, and the amounts of dust blown from Africa were an indicator of drought. His team documented a history of major changes in sea surface temperatures off West Africa, which are linked to the same pattern of climate change Bond found in the North Atlantic. DeMonocal and Bond demonstrate a dynamic climate system in which temperature and rainfall constantly change. Moreover, the cycle they have found long predates human industrial activity, and is linked to the variability of the sun’s activity. The two proxies strongly confirm each other and accord with the long-term stable data of the ice cores. This virtually destroys the old idea that our climate changes little and slowly between the ice ages. (see T. De Garidel-Thoron and L. Beaufort, “High-Frequency Dynamics of the Monsoon in the Sulu Sea during the Last 200,000 Years,” a paper presented at the EGS General Assembly, Nice, France, April 2000). Do I need to go on presenting evidence for the 1,500-year climate cycle, also commonly known as the “Dansgaard-Oeschger climate cycle”? I certainly can. Maureen Raymo of Boston College says that the Earth was undergoing Dansgaard-Oeschger cyles more than a million years ago based on research on the very long sediment core her team retrieved from the deep-sea bottom south of Iceland. The sediments show the same pattern of periodic surges in ice-rafted debris found by Gerard Bond, but coming from a period much farther back in time. (see W.H. Berger and U. von Rad, “Decadal to Millennial Cyclicity in Varves and Turbidites from the Arabian Sea: Hypothesis of Tidal Origin,” in Global and Planetary Change 34 (2002): 313-25). The fingerprints of this 1,500 year cycle are found all over the world. Ice-cores and seabed sediments that provide long-record data; peat bogs with organic residues; fossil pollens from around the world; long-buried trees and tree rings; stalagmites in caves where varying amounts of moisture and minerals dripped century by century; coral reefs whose tiny creators left behind clues to sea temperatures; ancient iron dust that reveal huge cycle-related droughts in ancient Africa and Patagonia; it doesn’t matter: all reveal mutually confirming evidence of cycles that stretch back into the planet’s history at least half a million years, through previous Ice Ages and warm intergalacials. The fact of the matter is this: we have seen repeated, documented warming periods which dramatically pre-date the industrial revolution or any other man-caused carbon dioxide-creating scenarios as causative factors. While the authors of “Unstoppable Global Warming Every 1,500 Years” also present a significant body of evidence linking the phenomena called “global warming” to solar activity, the fact of the matter is that human beings are 1) not the cause of warming; 2) unable to prevent warming; and 3) should not want to prevent warming. Warming has heralded dramatic improvements in human civilization every time it has occurred. It is ice ages that we should fear, not warming. Furthermore, the planet appears to have a mechanism to vent away the carbon dioxide that humans are creating. Research published in the August 2007 American Geophysical Union’s Geophysical Research Letters online edition by Roy Spencer confirmed the existence of a tropical climatic heat vent. This “natural thermostat,” which global climate models do not take into account, could single-handedly render much of the alarm over global warming moot. (also see “Natural ‘Heat Vent’ in Pacific Cloud Cover Could Diminish Greenhouse Warming,” Press Release, NASA Goddard Space Flight Center, 28 Feb 2001). There is simply increasing evidence that there is no significant link between CO2 and global warming. At the same time, we do have evidence that warming is occurring on other planets. One blogger has links to credible sources reporting “global warming” on Jupiter, Saturn, and other planets in our solar system. If anthropogenic CO2 is indeed responsible for global warming, then please do something about getting those darned SUVs off the gas giants! Or maybe the Martians are as reprehensible on the environment as China has been. We can examine ice cores from the Antarctic’s Vostok Glacier brought up in 1987 – on the other end of the world from the core brought up in 1984 from Greenland. Both showed the same 1,500 year climate cycle throughout 400,000 years of history. We can corroborate those ice-core findings with the known advances and retreats in the glaciers of the Arctic, Asia, North America, Latin America, New Zealand, and the Antarctic. We can find the 1,500-year cycle revealed in seabed sediment cores brought up from the floors of such far-flung waters as the North Atlantic Ocean and the Arabian Sea, the Western Pacific and the Sargasso Sea. We can find it in cave stalagmites from Ireland and Germany in the Northern Hemisphere to South Africa and New Zealand in the Southern Hemisphere. All show evidence of the Little Ice Age, the Medieval Warming, the Dark Ages, the Roman Warming, and the unnamed period before the Roman Warming. We can find it in fossilized pollen from across North America that show 9 complete reorganizations of our trees and plants in the last 14,000 years – or once every 1,650 years. There is overwhelming evidence for a 1,500-year climate cycle, plus or minus 500 years, available from one study after another, using one proxy after another, in one part of the world after another. We are currently 150 years into the Modern Warming, and our climate is just as the history and the science of these climatic cycles predict it ought to be. So why doesn’t anyone who hasn’t read know about the climate cycle? Why hasn’t the media reported on it? Why hasn’t the media reported more on the tropical climatic heat vent and other natural mechanisms that facilitate the disposal of so-called “global warming gasses”? Why aren’t scientists and pseudo-scientists such as Al Gore considering any of this information in their panicky scenarios? Why do we instead get bombarded on every side by a presentation that computer greenhouse gas models alleging terrifying cataclysmic patterns must be regarded as gospel truth when the theoretical fingerprints of these models have so often failed to match the observed data? Why doesn’t the established fact that we have cyclical climate patterns of warming and cooling and that we are currently in the warming trend of the cycle not merit prima facia status? Why should we trust a theoretical model that predicts a cataclysmic trend over a million years of actual documented history when science demonstrates a constant, continual trend? Should computer forecasting models be considered more reliable than ice cores going back hundreds of thousands of years? Let me take you back a few years when news of the “hockey stick model” first began to emerge that revealed what a debacle this model truly was. This is no straw man. Michael Mann’s model was a mainstay of the Kyoto-pushing United Nations Intergovernmental Panel on Climate Change (IPCC). Mann’s hockey stick figure appeared five times in just their summary volume alone. It was cited again and again by the media and by scientific papers as evidence of anthropogenic global warming until it was absolutely blown apart by a few determined researchers. The most chilling thing of all, however, wasn’t so much the general acceptance this terrible science received in so much of the scientific community and in the media, but rather the outright persecution that arose when scientists began to refute the model. As it turned out, independent scientists soon realized that they could not replicate the temperature curve of the hockey stick model even when using Mann’s own data. But even aside from that, Mann’s conclusions were completely falsified by literally hundreds of peer-reviewed research papers that had documented Medieval Warming. Yet scientists who attempted to reveal the truth were attacked within their own communities. Why? Because Michal Mann’s paper ostensibly provided the “smoking gun” proving anthropogenic global warming, and the fact that it was based on disgraceful science was apparently immaterial. Six editors had to resign from the journal Climate Research because they displayed integrity and courage in the face of a manufactured “scientific consensus” and Stalinistic tactics. Their crime? They published the article “Proxy Climatic and Environmental Changes of the Past 1,000 Years,” by W. Soon and S. Baliunas of the Harvard-Smithsonian Center for Astrophysics, which began to reveal that the emperor truly had no clothes. Richard Muller wrote an article about the fiasco with a subtitle warning of the “peril of letting politics shape the scientific debate,” which contains the above quote. David Deming and Richard Lindzen have also written about this disturbing trend which is transforming science into an instrument designed to crush the truth. Global warming is not about science, and it hasn’t been for some time. It is about politics, ideology, and power. At some point you simply must realize that the scientists claiming evidence of catastrophic anthropogenic global warming are not practicing science, but ideology. They are not objective researchers who carefully investigate the data and cautiously report their findings; rather they are the kind of people who would give Al Gore – a radical environmentalist and a documented perpetuator of scientific fraud – a Nobel Prize simply because his agenda is the same as their own. By claiming that the planet is in crisis, these leftist ideologues are able to garner enormous political clout not only through increasingly large academic, private think-tank, and governmental research grants, but by having direct control over vast swaths of the global economy and trillions of dollars in assets. Centralized planners with “megalomaniac ambitions” are now working to restrain democratic development and economic activity under the guise of environmentalism, said Vaclav Klaus, president of the Czech Republic. He spoke Tuesday morning at conference in New York City. Klaus, an economist, said he opposed the ‘climate alarmism’ perpetuated by environmentalism trying to impose their ideals, comparing it to the decades of communist rule he experienced growing up in Soviet-dominated Czechoslovakia. ‘Like their (communist) predecessors, they will be certain that they have the right to sacrifice man and his freedom to make their idea reality,’ he said. ‘In the past, it was in the name of the Marxists or of the proletariat – this time, in the name of the planet,’ he added. Is it going too far to compare global warming alarmist scientists and bureaucrats and their policies? to the Stalinists of the communist era? Not when they use the kind of tactics they are using to destroy their opponents and prevent opposing viewpoints from being heard and evaluated. And not when they seem so terrified by free thought.